A real-time journey mapped with stats and shots. 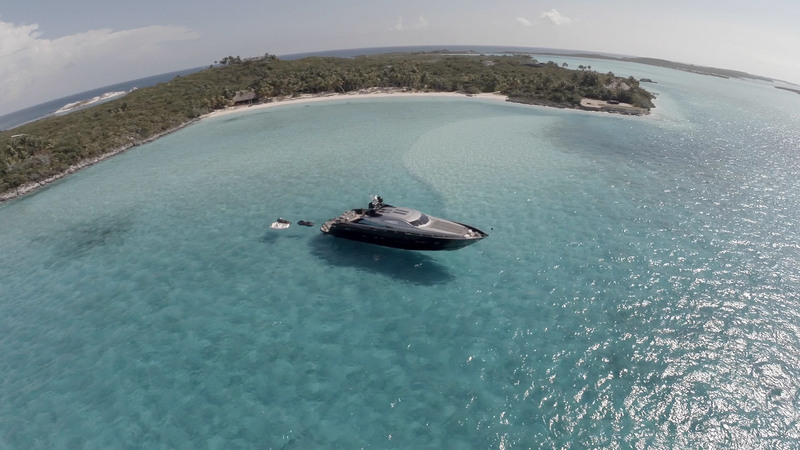 Take this superyacht on a journey of your own. 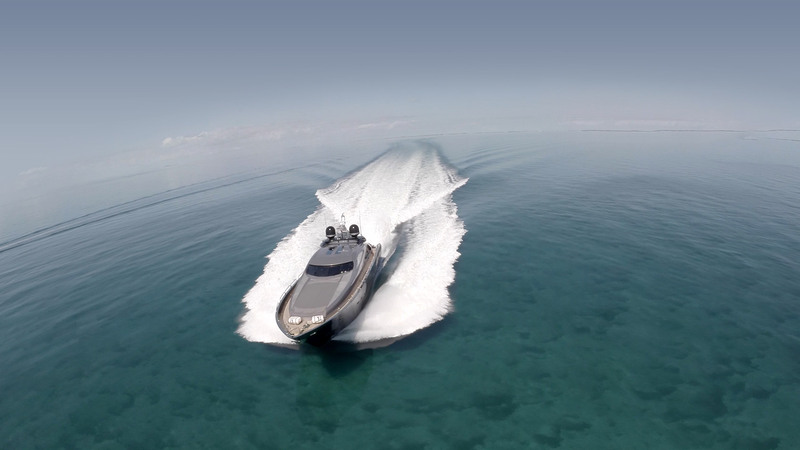 100 feet of extravagance, Murcielago is your private jet of the ocean. 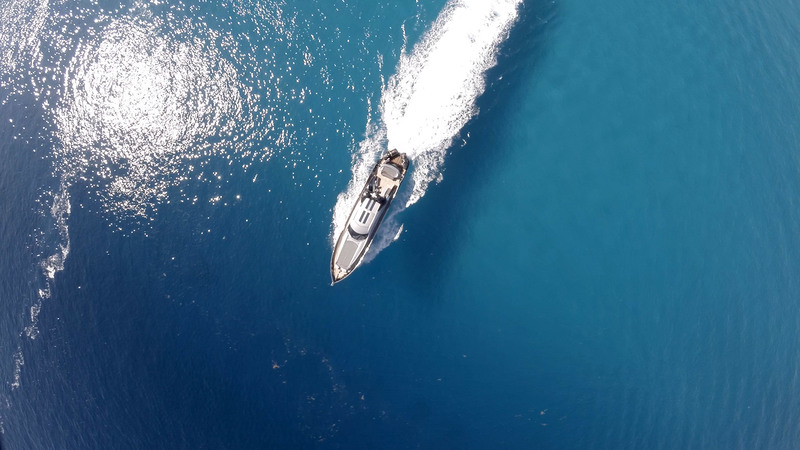 A superyacht with comfort and speed so you and up to 11 guests can experience more luxury in a day charter than you ever thought possible. Navigate through this site and discover all that Murcielago can offer. Take the six-star luxury with you to your idyllic Sydney destination. 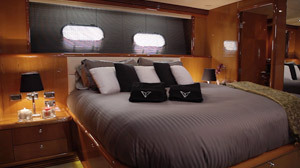 From the sumptuous Owner Room and VIP Stateroom with their en-suite bathrooms, to the two twin-berth cabins, this superyacht can sleep eight people as comfortably as any high-end hotel. Indoor areas include spacious saloons, lounges and decks – one with a retractable sunroof; guests can enjoy seating for up to 10 people and a fantastic barbeque offers outdoor cooking options to impress. 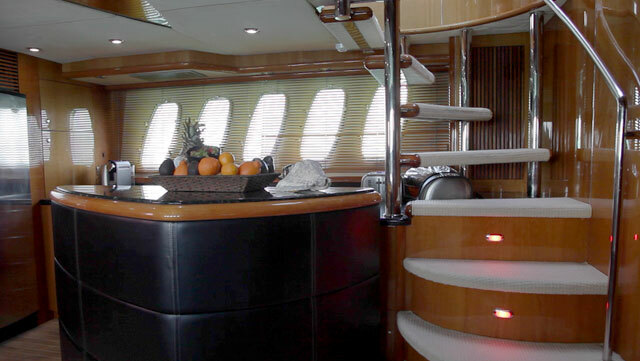 There’s a fully equipped galley with teak flooring, stunning granite bench tops and, naturally, its own espresso machine. Full catering to restaurant standards for all guests can be prepared by our own on-board chef, and a drinks bar can be stocked with every beverage you could ever desire. Drawing you outside are massive sunbeds and a bathing platform, turning every sea into your own private pool. The bathing platform also has a hot shower and a wet bar. 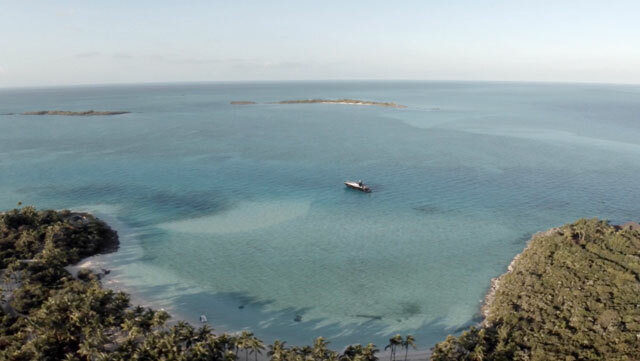 Perfect once you have finished your swim or snorkel, or a paddle in on of Murcielago’s three canoes, or a water-skiing/wakeboarding session with Murcielago’s on-board equipment. 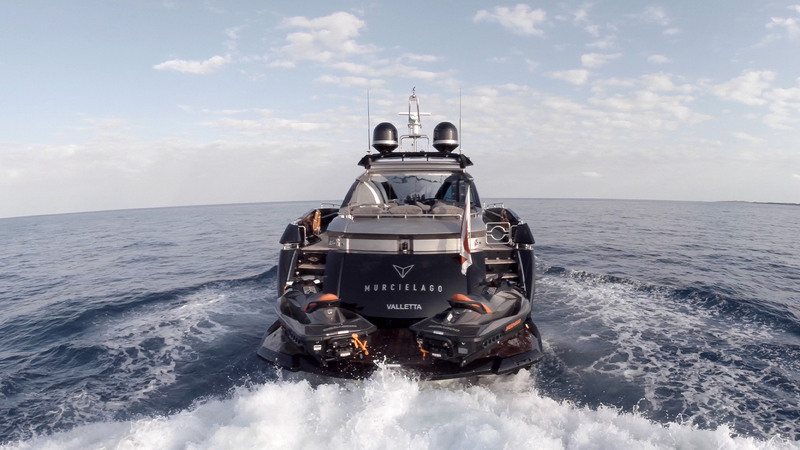 For a rainy day or a long voyage, Murcielago is equipped both inside and out with a wide variety of options to enjoy your down-time, from a fully equipped widescreen entertainment centre to intimate board games and more. A Sonos surround sound system allows crystal clear quality music throughout the vessel beamed straight from your personal device. The luxury comfort even extends all the way to temperature-controlled areas where guests can customise their own environment with separate heating/cooling zones. Just one of the many reasons why Murcielago is such a great way to fly. Where would you like to go for your day? Sydney Harbour, Pittwater, Bondi? It’s tempting to swim to the beach. Maybe just drift there in the tender. 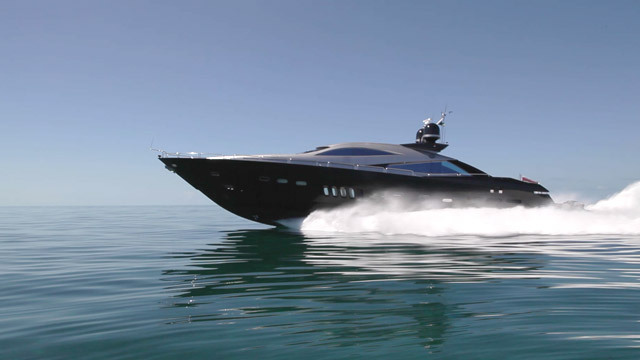 Or perhaps head for a full harbour cruise and show off Murcielago’s speed and beauty. Going above or below deck, you’re going to end up somewhere nice. Every area on Murcielago has been meticulously well thought-out. Imagine your own café, restaurant and bar, where you choose you own guests and music, and the view changes at your very whim. It’s called Murcielago. 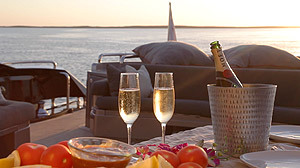 Berths for you plus seven guests are appointed with comforts you would never expect on a vessel so fast you can’t believe. Our crew in their separate accommodation are there to look after all your needs. Vessels this large are automatically labelled superyachts. However, Murcielago is super in every sense. 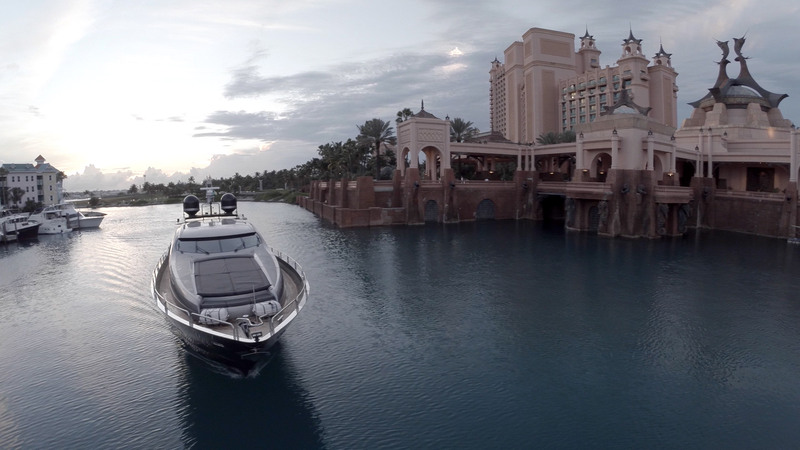 Its opulence can make you forget that this vessel can cover vast distances between destinations in less time than you would believe. 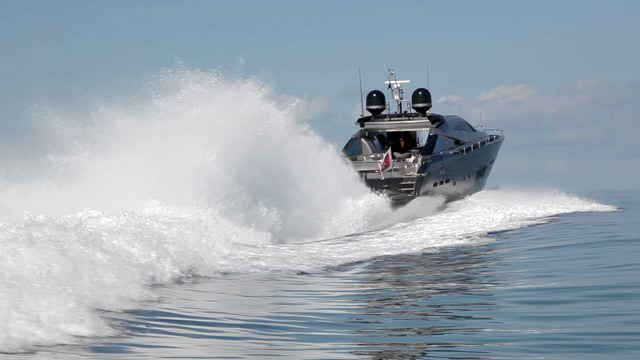 Ask the crew to ‘open her up’ over flat water and feel the thrill of the ride and a top speed of 47 knots (nearly 90km/h). Otherwise it can comfortably devour 400 miles of seaway at its cruising speed of 26 knots. Or you can extend that range to 1200 miles by gently motoring overnight to arrive at your destination first thing. And when the engines finally subside to a cat-like purr, there’s no need to slow down. 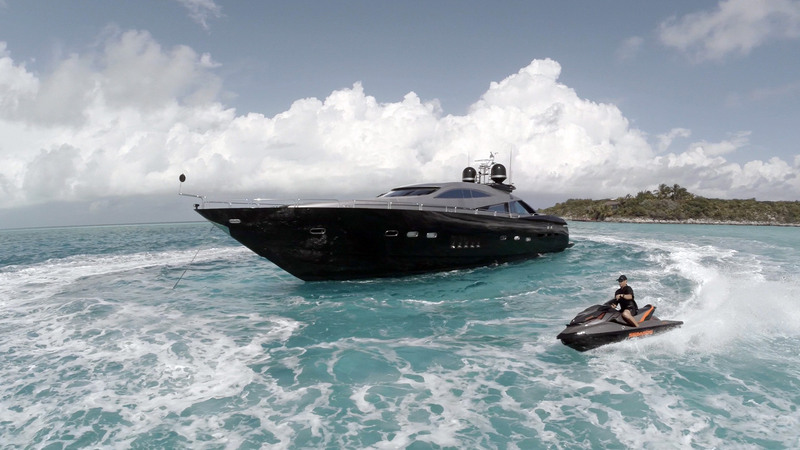 The Williamson jet tender watercraft kept inside the stern ‘garage’, is capable of a mind-boggling 45 knots. 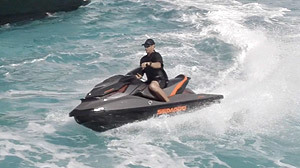 Available in Pittwater only, the two Seadoo jet-skis are also capable of 45 knots meaning every other toy on board, like the wakeboard, kneeboard and water skis are built for speed too. 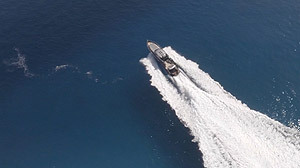 Yet none are quite as fast as the superyacht that carries them. A Sunseeker 100, Murcielago is one of the fastest vessels afloat, allowing you to visit several areas of Sydney’s waterways in one day. 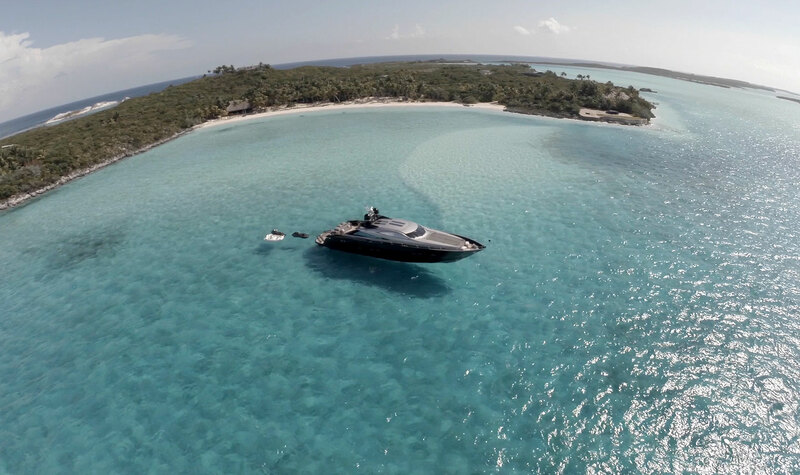 Driving 100 feet of superyacht at 47 knots requires putting a lot of water behind you. 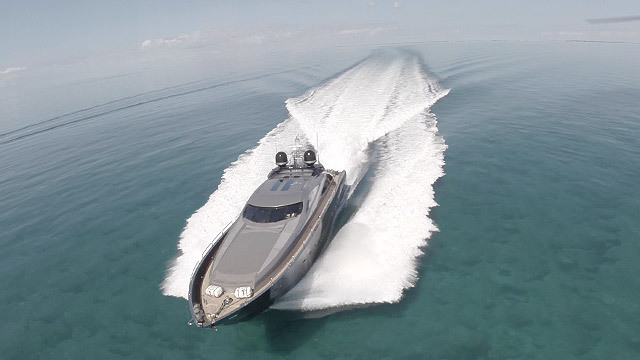 You’ll be doing it with 6000 horsepower from three diesel engines. It’s not only the Murcielago’s speed that turns heads. 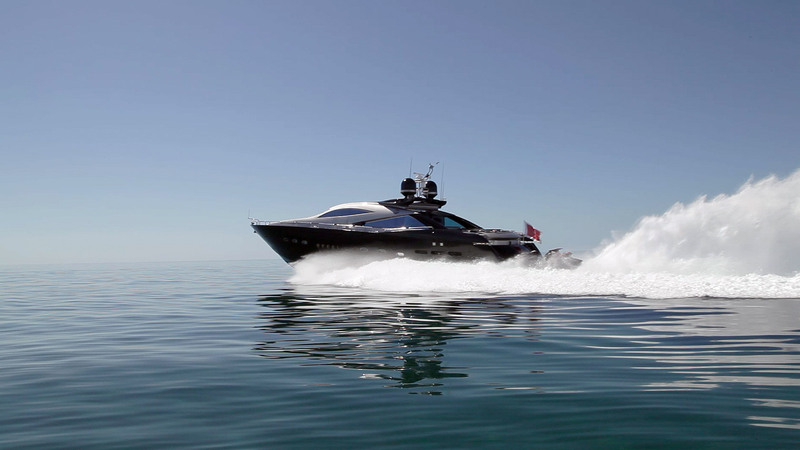 Its sleek yet muscular design is as awe-inspiring for those who witness it, as it is for those on board. Commencing countdown engines on. 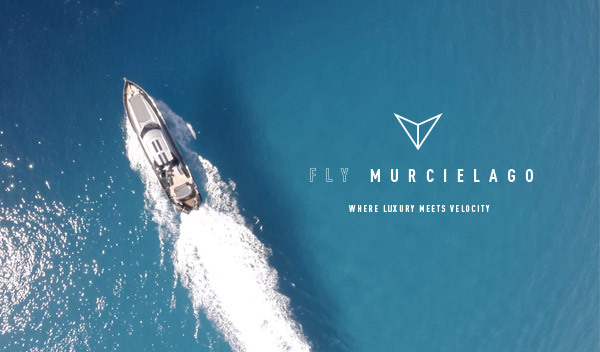 Murcielago’s airport is any marina or anchorage. It’s runway, Sydney’s waterways. Its sky, the big beautiful ocean. 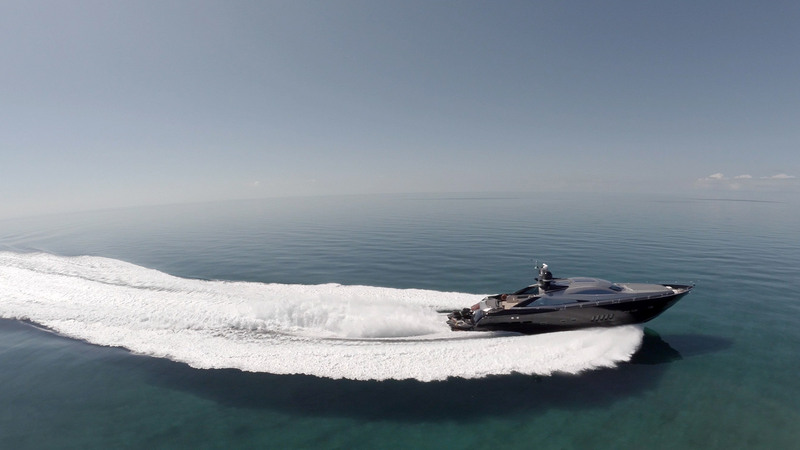 If in Pittwater, Murcielago comes with two GTI 255 2-man Seedoo jet-skis capable of 45 knots. So you can play in, and explore, Pittwater with pace. Explore the Mucielago’s Cuban experience on a round-trip from Miami to Havana with this interactive timeline. It’s the journey mapped, with real-time travel stats and shots taken along the way. 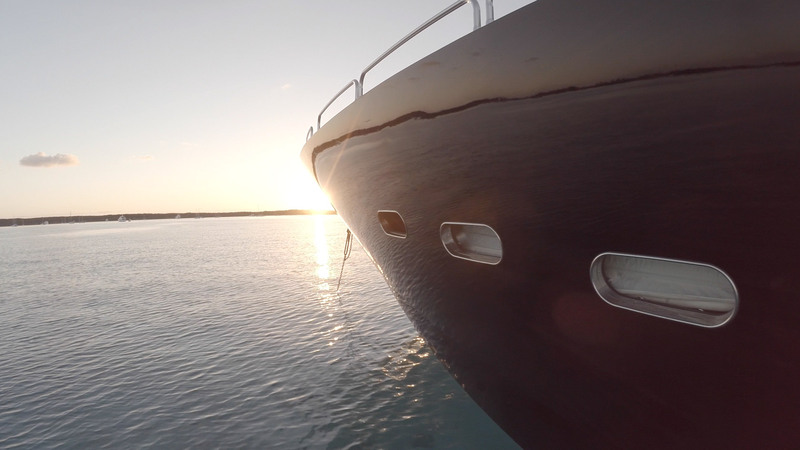 Murcielago is available for day charter with our captain, first mate and chef (if required). Start planning your ultimate adventure with friends, a honeymoon or couples’ cruise, or an unforgettable family getaway. Any enquiries (including alternate charter destination suggestions) will go direct to The Captain. Simply add your details and note to the form on the right. Please enquire for daily, overnight and weekly rates. For a printable pdf of the information on this website, click on the download link below.